Over the years, medical experts have opined that standing has a lot of health benefits. Prolonged sitting poses some health risk including pressure ulcers and skeletal deformities. With the introduction of the standing wheelchairs, users can now gain the health advantages of standing. The standing wheelchair can be operated mechanically or with powered controls to shift between a comfortable sitting position and a secure standing position. Changing positions allow blood to properly circulate the body while staying in a particular position all day causes the blood to stagnate and prevents blood from flowing to other areas of the body. It is advisable to regularly change your posture to prevent blotting of your body parts such as the legs. Continuous sitting can cause muscle spasticity. Many wheelchair users report that switching position helps them to experience less spasm as standing loosen up the muscles and decrease spasticity. Sitting in a wheelchair does not make wheelchair users sick, rather the secondary diseases that come as a result of sitting down continuously such as Urinary Tract Infections (UTI) does. According to recent research, being on a standing wheelchair helps prevent UTI’s which are prevalent with regular wheelchair users. Wheelchair users often suffer from inadequate bowel performance. Medical experts have suggested that standing up exercises can improve bowel performance. The outcome is similar when using a standing machine or standing wheelchair. Pressure ulcers which is one of the secondary diseases caused by prolonged sitting occur when there is too much pressure on one spot of the body. It can, however, be avoided by standing and allowing blood to circulate the body. Standing wheelchairs aids in the distribution of your body weight and allows bed sores to heal faster. Continuous sitting can cause the joints and muscles to tense up. The best way to relief your muscles is by exercising them. Standing helps you to reduce the level of tightness you feel in your muscles and joints. A major psychological benefit of standing wheelchairs is improved blood circulation which in turn brings about greater cognition. The cognitive abilities of wheelchair users increase significantly with the use of standing wheelchairs helping to remember and concentrate better. Lying or sitting down for long hours causes severe tiredness. The muscles tissues, joints, and bones easily become weak once there is no movement. Standing allows you to stretch out your muscles and minimizes fatigue. A standing wheelchair helps to improve your well-being and boost your self-confidence. You can hug in a standing position, make eye contact, collect items from the cupboard and even pose for photos using a standing wheelchair! 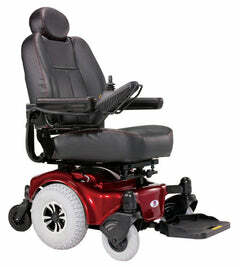 You can locate Upzy’s collection of wheelchairs (power/electric, standing, manual) by clicking HERE. Electric Bikes- The Future Mode Of Transportation? 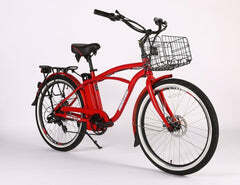 Electric bikes are an alternative to standard bikes and motorcycles. They provide transportation from one place to another. Since they are similar to a regular bike, you can ride them anywhere. The advantage is that you can rest while riding an electric bike. It will do all the work for you. You won't have to get off the bike and push it up a hill. The motor on the electric bike is powerful enough to propel you up a steep hill quickly! Most electric bikes use a battery to generate power. Some electric bikes have an automatic shut off that stops the motor from discharging the battery completely. If the battery is completely discharged, its lifespan is reduced significantly. There are a couple of battery options, including the 10Ah standard battery and the 12.5 Ah battery. An adequate motor for climbing hills and accelerating is 750 watts. 20 mph at 750 watts is the limit for road use. Anything above 750 watts has to be used off-road. This is the Federal road speed limit for electric bikes. 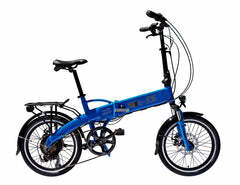 The Striker motor and Thunderbolt motor are two types of motors in electric bikes. The Striker motor has the most torque and speed. It propels the bike at a speed of 18 mph at 750 watts. The Thunderbolt motor is less powerful, but adequate for most riding adventures. It can propel a bike 20 mph at 750 watts. Both of these motors have higher voltages and higher speeds. The fastest motor available is Black Lighting; it has a top speed of 40 mph at 2,000 watts! The 2015 HPC Cruiser is an ideal electric bike. 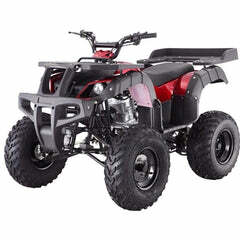 It features a 2A charger, half twist throttle, a HPC brushless and gearless DC direct drive motor, and a HPC Li-NMC battery. There's a brushless DC controller with 11g of sliver plated phase wires. It is available in three sizes, three different power systems, and several colors. Another electric bike worth mentioning is the 2015 HPC XC Electric Bike. 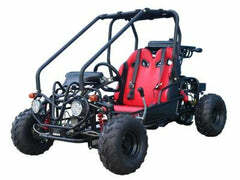 It has a powerful 5500 watt motor and all-wheel drive. It is a mountain electric bike with a 70:30 torque split. 70% of the power goes to the rear wheel, while 30% goes to the front wheel. It comes with a frame bag that holds various items; it's waterproof and features dual YKK zippers. There are three models to choose from: XC-1, XC-2, and XC Elite. The XC-1 features Tektro hydraulic disc brakes and a 27 speed drivetrain. The Elite version has an optimized, high-speed pedaling design that features a Schlumpf High Speed Drive planetary geared crankset. It also features simultaneous hydraulic lockout for the front air fork and rear air shock via a single push button. On this bike, casual pedaling produces an astonishing speed of 50 mph. 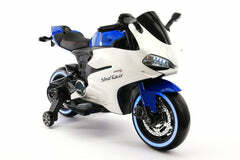 For Upzy's full collection of electric bikes, please click here. 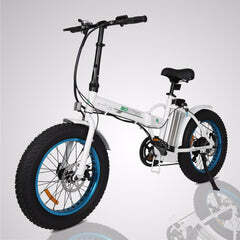 We are Authorized Dealers for hundreds of e-bike brands. When it comes to buying bikes, there are a number of reasons why you should head to your local bike shop. There are a variety of benefits that come with bike riding and when we add bikes to our preferred means of conveyance, we can enjoy a number of advantages. Read on to learn more about the benefits of bike riding! In a world that is full of pollution caused by the mass quantity of automobiles on the road, riding bikes allows us to do our part to reduce the level of smog in the air. Even something as simple as swapping out one of your weekly work commutes for a bike ride can have a positive effect on the world around you. Reducing the amount of toxic emissions that are created by excessive drinking is just one of the many benefits bike riding has to offer. We've all heard the excuses from those who "plan" to work out about not having enough time, but by riding a bike to and from your place of employment, you are able to incorporate a workout into your daily schedule, with minimal sacrifice to the rest of your day. Bike riding is easily integrated into our daily living and those who rely on bikes for their transportation are able to get healthy and fit as a result. When we allow ourselves to become couch potatoes who sit at home every night, it becomes very easy to rely on beer or trashy television as a means of entertainment. However, bike rides offer a way for us to have good, clean fun, without vegging out in front of the tube every night or heading out for a drink every time we get bored. The next time you find your friends or family complaining that there is nothing to do, be sure to bring up the benefits of bike rides. With added physical activity comes increased mental clarity and bike rides are certainly no different. Bike rides are proven to boost our level of energy and greatly diminish fatigue. Even a daily 30 minute bike ride does wonders for our creative thinking and reaction time. Anxiety and depression are also reduced as a result of bike riding. According to a few recent studies, adults who make time for bike rides live longer than those who choose to neglect the importance of physical activity. Small amounts of daily exercise correlate to a longer life expectancy and bike rides are one of the most enjoyable ways to keep fit. They allow us to exercise, without feeling as if we are exerting ourselves and what could be better than that? We all know that it can be difficult to set aside time to work out and it is also difficult to find a workout that you truly look forward to. Everyone’s had that moment where they fantasize about avoiding their workout, but by embracing the benefits of bike riding, you will be able to start a workout plan that you will love, despite its inherent difficulty. It can also be used as a way to warm up and energize for other workouts that you are planning on doing later. Interested in the benefits of bike riding and want to take the plunge and commute in an energy-efficient way? 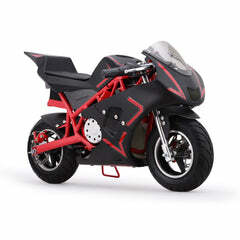 Check out our bike collection here. 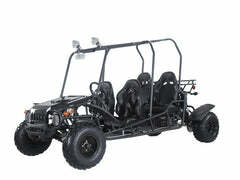 Off-Road ATVing- Ride Like A Rockstar! 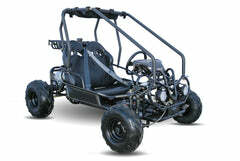 If you've ever been off-roading, you probably got the chance to try driving an ATV (all-terrain vehicle). If it wasn't the most fun you've ever had in your life, you're doing it wrong! ATVs are a great way to get out and about while simultaneously finding a new challenge on every rock and crag. 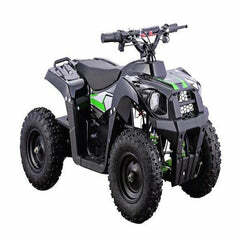 Some people may think that ATVs are dangerous, but these recreational vehicles are right in the range of others like the snowmobile or jetski. They're a blast to drive, so pick up an electric or gas-powered one today! Workouts can and will occur outside of the gym, just not in the way you think. 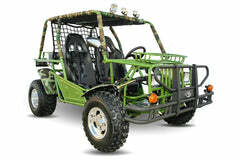 Riding an all-terrain vehicle, whether gas or electric, is more of a workout than it looks like. It requires balance, precision and a firm hand, but it's easy enough for anyone to do. Well, just about anybody – we don't really recommend this exercise regimen for your 98-year-old grandma – but youngsters and adults alike can enjoy the sport. There are some places that four-wheel drive just can't take you, and that's where the ATV comes in. These things can climb and scale a rock wall; we've seen them do it. Once again, we don't recommend doing this type of maneuver unless you are very experienced, but you get the idea. ATVs can take you to places you've never been and let you explore the real outdoors, away from distractions and paved roads. Sometimes, the best therapist is a rumbling engine and a boost of adrenaline. 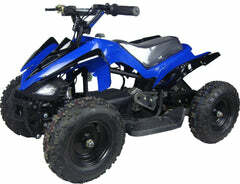 ATVs can get up to speeds well over 30 mph. That's a lot of horsepower for an open vehicle, so exercise caution when operating at those speeds. The feeling of wind in your hair and the crunching of the great outdoors beneath your wheels will allow the stress to melt away. Ride the backroads. Climb a hill. Your ATV can handle it. Many families spend time together on their ATVs, even the little ones. 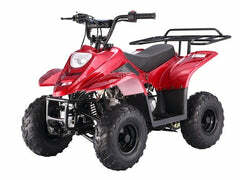 There's quite a bit of selection for pint-sized ATVs that have room for your child to grow. Until they get comfortable riding their own ATV, taking them for a ride is just as fun. In fact, take the whole family out for a nice ride! You'll get to see a side of nature you've never seen before, and your family is sure to love the experience. 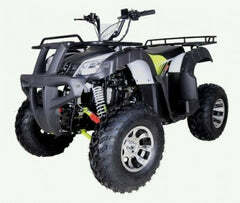 You may soon find you have a whole fleet of ATVs! We all know at least one or two people who say, “I hate sports”. That's what makes ATVs so great – they're loved by everyone! ATV rides are one of the very few activities that anti-sports people like, so take full advantage of this when you run into one of them. ATVs bring people together in a sport that's easy, fun and challenging all at the same time. 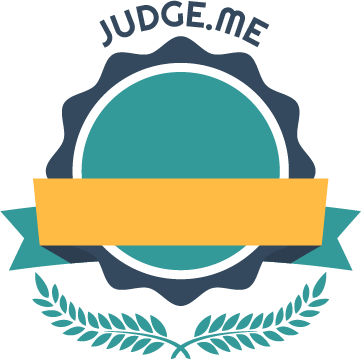 Upzy (formerly known as Super Scooter Store) is proud to present a collection of body-powered and electric all-terrain vehicles! Balance Bikes- Your Kids Will Love These No-Pedal Wonders! We realize it's tempting to start your youngster on the Harley Davidson right away, but your little tyke just isn't ready, and riding a bicycle right off the bat won't go over any better. Sure, you could get them a trike until they're big enough, but starting early on learning to ride a bike is possible with kids' balance bikes. What Is A Kid's Balance Bike? We're glad you asked. Kid's balance bikes are pint-sized two-wheelers that are just like normal bicycles, but they don't have any pedals. Your child pushes the bike forward and backward by using their feet. Imagine Fred Flintstone in that car of his, and you'll get the idea. By the time your child grows up big enough for a regular bicycle, he'll already have most of his technique down pat – just add pedals! The smallest balance bikes sit just a foot off of the ground. Your child can easily sit down while pushing himself around with his feet and legs, which will help them get a feel for what it's like to ride with just two wheels. This is a much safer approach to learning than training wheels because you decide whether you tip over or not. Training wheels can be wobbly, and they don't do much to stop your child from falling if they turn too sharply. With feet firmly on the ground, your toddler is in full control. Kids outgrow stuff fast, especially height-dependent recreational toys like bicycles. Balance bikes are a great way to save money by getting rid of the tricycle and training bicycle that you would quickly have to switch out anyway. Balance bikes let your kids go straight to a 16” or 20” bike right away after they outgrow theirs, and you can always get a good resale price for the balance bike if you don't have any other little ones. Tricycles and training wheels don't really teach you how to balance on two wheels. They're more like a crutch, and the only way to really learn how to ride a bike is to just go for it – unless you have a balance bike. Balance bikes help you, well, balance. Rather, they help you learn to balance and stay upright on two wheels, something trikes and training wheels can't do. Why go from three wheels to four wheels to two wheels? Doesn't that seem a little backwards? How much exercise is your kid really getting by riding a trike? They sit down and roll the pedals around, but their legs are the only part of them that's moving. Bikes with training wheels are even worse. 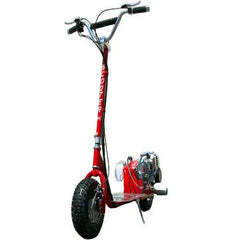 The movement of the pedals is directly underneath; at least trikes make you stretch your legs forward and work for it. Balance bikes require the child to use their whole body to steady themselves, even when they've got their feet flat on the ground. You won't watch your kids grow up to be couch potatoes, that's for sure. Check out Upzy's (formerly Super Scooter Store) extensive collection of balance bikes HERE! You've got a sweet set of wheels that you love showing off on every street and boulevard, and you're proud to say that you turn a few heads along the way. No, you don't drive a Ferrari. No, not a Harley-Davidson either. You're saving the environment on your brand new electric scooter, and no one can dull your shine as you enjoy a guilt-free ride to work or favorite hangout. Before you had an electric scooter, you spent a good chunk of your morning trying to find a decent parking spot. The unforgiving urban cityscape, spattered with expensive parking garages and hungry meters, was getting old pretty fast. Thanks to your electric scooter, you can bring your ride into work without any hassle. Electric scooters are the next big thing, and they're catching on enough to make them one of the most popular internet purchases. Electric scooters make the ride to work more enjoyable. It's time to stop gazing out of dirty car windows and really get to know the city. With electric scooters, you can take a more scenic route through city parks and streets. Also, there's less traffic this way! Don't get stuck in another traffic jam. Ride your electric scooter to work, and you may just have time to have a sit-down at your favorite coffee shop for a latte and scone. You're not just making your life easier by buying an electric scooter; you're helping make the planet a better place. Remember those traffic jams we were talking about? Motor vehicles send up a waft of fumes that choke the ozone and make the air dirty, so why would you want to contribute to that with your Hummer or SUV? Electric scooters are quiet and emit no fumes, making them an eco-friendly way to get around. They're so quiet, in fact, that you'd do well to take care when riding on the street; cars probably won't hear you coming. Instead of a noisy motor and gas consumption, electric scooters use lithium batteries that are long-lasting to power an electric motor. Lithium batteries are well-known for their long life and are a dependable energy source for electronics worldwide. A charger cord is included with the scooter, so you don't have to worry about getting stuck at the office with a dead battery. Simply charge it if you need to, and enjoy the ride home! 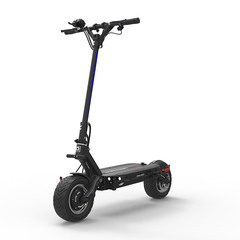 Top it all off with a durable kickstand and an easy-to-use controller, along with speeds up to 20 mph, and you're on the fastlane to being an eco-warrior who doesn't worry about parking spaces. We've got several of your favorite brands to choose from, including popular brands like Ecoreco, I-Max, Go-Ped, and more. These electric scooters come in all shapes and sizes, from the classic two-wheel with handlebars to trikes and self-balancing scooters. If you're tired of long car rides with 'blah' views, get an electric scooter today and watch your commute turn into an adventure! Electric Ride-On Cars, Perfect For Kids! If you were fortunate as a child, your parents bought you an electric ride-on car. You rolled around the neighborhood, flashing your new set of wheels and showing off to your friends. You were practically a race-car driver in your own mind. Anything from Hot Wheels to Barbie Jeeps were available, and you drove that car around until the battery gave out. What if you could give your kids the same joy and wonderful memories you had when you were a kid? Needless to say, kids are spoiled nowadays. While you had only two or three models to choose from (four, if you were lucky), there are now dozens of electric ride-on cars modeled after popular makes and models. Kids can choose a Barbie Jeep if they want to, but why do that when there are Lamborghinis? In all honesty, your kids will drive brands like Mercedes-Benz and BMW while you gaze longingly at your Honda that's parked in the driveway. And yes, there are also Bentley and Audi models. Electric ride-on cars of ages past lasted a couple of years if you were lucky, and they lurched forward at the pace of a snail. 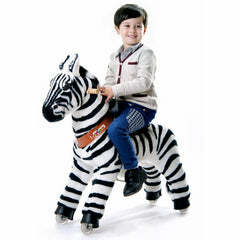 Kids' modern day electric ride-on cars come equipped with a power-packing rechargeable battery that won't fizzle out. It can be a real let-down for your child when they go through a growth spurt and grow out of their fancy H2 Hummer. These electric ride-on cars can hold upwards of 60-70 pounds; if you get the car for a toddler, that's a lot of growing room! The battery lasts so long on these cars that they may just last through a couple of generations. What would you say if we told you that our kids' electric ride-on car selection had more variety than most car dealers? What is normally an inconvenience for adults hasn't yet passed on to the next generation. No, these kids get all their favorite car models in one place. Take, for example, the Harley-Davidson motorcycle. It's an attractive vehicle that most adults would die to have, and here it sits in your garage, ready and waiting for your child to take it for a spin. It's almost unfair. 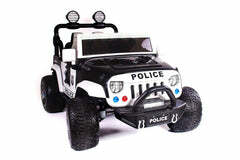 We've even included models like tractors, SUVs, the Mini Cooper, and the Batmobile. The Batmobile. One advantage adults have over children is that they're licensed to drive vehicles with speeds up to 200 mph. To make sure your child has a fun, safe playtime, electric cars come with a maximum speed of 2.5 mph, just enough to let your child feel like they're really cruising. To give you some perspective, the average jogger moves at a speed of around 5 mph, and walkers move at a pace of anywhere from 2 to 4 mph. That means you can walk side-by-side with your child as they burn imaginary rubber. They won't be able to get away from you, but they'll feel like they're a superstar! 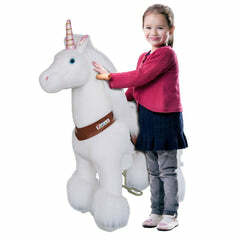 Interested in giving your kid the coolest gift in the world? Check out our electric ride-on car collection here. Do you remember the good old days when you were a carefree kid, riding around the block on your sporty red tricycle? Fond memories don't have to be just memories. Recumbent trikes can be a great way to get exercise, as well as relive the nostalgia of your younger years. Recumbent trikes are three-wheeled bicycles where the person riding one is either lying down or leaning farther back. Unlike a typical tricycle where the rider is seated in an upright position, recumbent trikes require you to be in a reclining position, much like you would in a reclining chair. Recumbent trikes come in two different versions: one with a single wheel in front and two wheels in the back, and the other where the wheels are switched to have two in the front and one in the back. 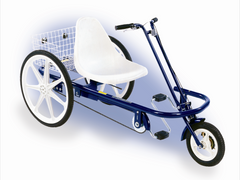 Although recumbent trikes are mainly for adults, children's versions are available. Why Should I Buy A Recumbent Trike? It may seem silly to some to ride a tricycle, recumbent or no, but there's great value in using this particular design. Once you've tried a recumbent bike, you may not want to go back to a regular bicycle at all! Riding in an upright position can be uncomfortable, even if it's on a fancy padded bike seat. Gel cushioning, foam inserts and more won't keep your spine and tailbone area from getting sore, but recumbent trikes allow you to ride in comfort while keeping your neck, back and lumbar region supported. Seats on recumbent trikes are larger, and they spread your weight more evenly and relieve pressure on otherwise tender areas. This means you can go farther and faster without having to visit the chiropractor afterwards. If you've ever watched the Tour de France, you'll notice that cyclists are bent forward over their bikes in an attempt to get into a more fluid position. Wind resistance and drag make it difficult to reach higher speeds. Recumbent trikes have an aerodynamic design that lets you fly down roads and bike trails while maintaining proper stability. Since you'll be reclined, your body will naturally create less air resistance and drag, and the front of the trike's lower height will also increase its aerodynamic properties. Riders using a recumbent trike will find that they don't get as worn out as quickly as they would using a typical two-wheel bike. Not everyone is a long distance rider, but recumbent trikes make it easier to go further with their excellent design and performance. Just like a regular two-wheel bicycle, recumbent trikes have different speed gauges (some up to 26 speeds!) that allow you to gradually work up to longer distances, but the bike itself makes it simple because of its speed capabilities and superior comfort. You'll be able to bike for longer as you roll across the countryside enjoying the view. You'll still get the same workout, but at half the effort a normal bike would require. 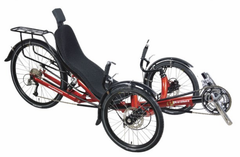 Check out our recumbent trikes collection here! 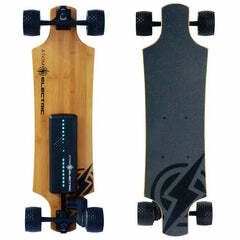 Electric Skateboards Are The Future! Skateboarders are the cool kids on the block, but constant pushing and balancing can get pretty tiresome. Skateboarding is more of a workout than fans give it credit for, but a new innovation in skateboarding technology will have even beginners begging to try out an electric skateboard. An electric skateboard is basically a motorized version of the classic design, but there's more to it than meets the eye. Electric skateboards have been around for a few years now. They are becoming quite popular with the tech trend crowd, but bystanders are still in the dark about why anyone would choose an electric skateboard over a classic model. After all, what's the fun in skateboarding if you don't do the push work yourself? Reach speeds you couldn't before! Electric skateboards use a power motor that can reach speeds up to 25 mph, which is pretty fast for a human to go. Classic skateboards might reach that speed going downhill, but uphill is another story. With electric skateboards, you let the motor do the work for you. Don't worry; you'll still get a workout. Balancing on a skateboard takes a certain amount of skill, but you can feel the freedom of sailing through the streets on a tiny set of wheels no matter which direction you're going. It's a skateboard with brakes! We bet you've wished you had brakes on a skateboard, but now you can! 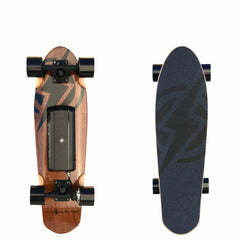 Electric skateboards have a powerful brake system. It won't stop you on a dime, but it sure beats using your feet. The acceleration and brake system can be controlled via a wired or wireless controller, though most prefer the wired version to prevent interference from other electric signals. The brake system not only helps you stop and go whenever you choose, but it could very well save your life if you lose control of your roll. 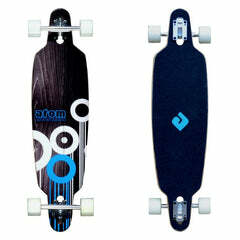 There are several models of electric skateboards available, and each have their distinct advantages. Lighter models will allow for a smoother, faster ride, but there won't be adequate room in the design for a quality battery. 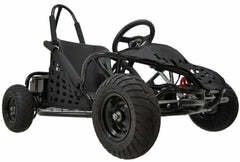 Heavier models, on the other hand, have a large enough battery, but they're bulkier and more difficult to steer. There are many models that fall in between that have a good balance, but it's up to you what you want out of your electric skateboard. There's one for everyone, so browse the various model choices until you find the right fit. There's definitely a cool factor to riding an electric skateboard. After all, who wouldn't pay attention to a self-propelled skateboarder? It's like a magic trick. With the power of a motorized skateboard, you can go faster and do tricks you couldn't get the height for before. You can cruise the streets on a smoother, safer ride that makes you look like you're a professional. As more and more electric skateboards become available, you'll have already well-established yourself as a trendsetter, so hurry up and get one before the others do! What is a Self-Balancing Hoverboard? You might heard or seen this two-wheeled futuristic looking gadget on your street, I personally thought that is was the exact hoverboard Marty Mcfly used in the Back to the Future movies. 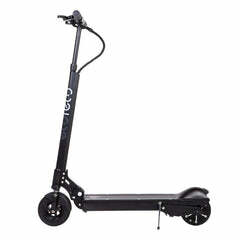 Some people may also get confused, thinking this is variant of a Segway or a handle-less electric scooter. Let us introduce you to the "Self-Balancing Hoverboard" a viral piece of hot technology that is surging in popularity today! These Hoverboards have been widespread due to the prevalence of teen stars sporting them, talk show hosts featuring them, and multiple guest sitcom appearances. This Hoverboard uses advance wheels sensors and a gyroscope to assist the user in operating the board. The main wonder here are the pressure pads located directly below the hoverboards footrest- this detects your foot movement so the board knows exactly how you want it to behave - and here I thought it was reading my mind! 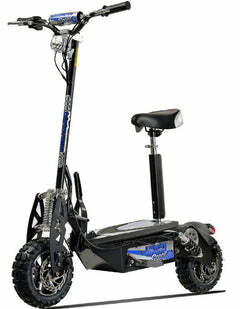 A full charge of this machine will give you 2-3 hours of riding fun which translates to roughly around 15 miles. Be sure to have your helmet and knee pads ready if this is your first time riding the self balancing Hoverboard as this is like learning to ride the bike all over again, though learning this takes less time. You will have more fun, fall less, and not stumble around! If you’re looking for more outdoor fun activity and you are a technology junkie this new toy might be the perfect gift for yourself or for your love ones this coming holiday season! Upzy (formerly Super Scooter Store)- your one-stop shop for all your personal transportation needs!